The latest versions of iOS support an optional display mode that turns everything shown on the screen of an iPhone or iPad to black and white. Called Grayscale mode, the setting is mostly intended as an accessibility option, but it has other uses beyond that as well. 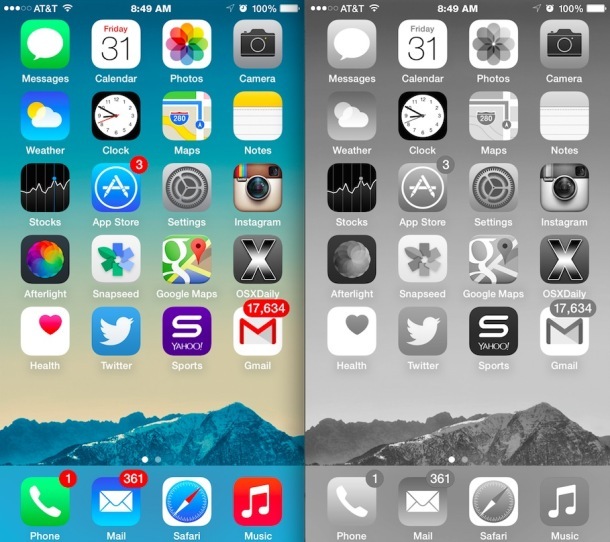 This tutorial will show you how to turn your iPhone or iPad display into grayscale mode, stripping away all color from the screen. The color change of Grayscale mode is immediate and all saturation will be removed, changing the visible screen to shades of gray into what is basically black and white. If you’re using Grayscale mode for vision purposes, it’s probably a good idea to enable Bold Text, Darken Colors, and On / Off button toggles too, both of which make things a bit easier to interpret on a display of any iPhone or iPad. Toggling Grayscale on will instantly switch the screen and everything on the display to black and white, but it has no impact on actual images on the device, or even screenshots. For example, if you have Grayscale mode on but take a photo with the Camera, the picture will appear in color as it normally would, at least until the image has been manually converted to black and white. 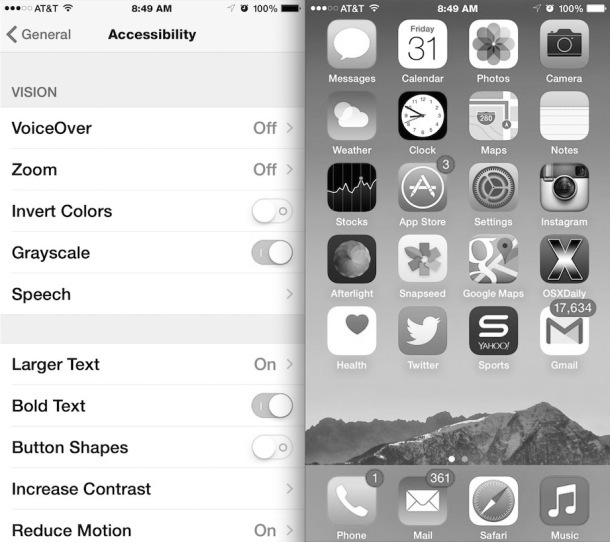 The same applies to screen shots and videos taken with the iPhone or iPad in grayscale mode. Grayscale mode is likely intended for users who have certain vision difficulties or are colorblind, where onscreen color elements may look garish or outright challenging to interpret. Beyond that, grayscale mode can function similar to the invert colors trick as an alternative display mode for use in a dark or dimly lit area, or to tone down color or saturation on an app or webpage where it becomes intrusive. It can also make for an interesting alternative look if you just get bored with seeing colors, or if you feel like yanking someones chain, a relatively harmless prank on an unsuspecting user. For those who are curious, Mac OS X includes the same setting for Macs to run in grayscale mode as part of the Accessibility preference panel options. Grayscale mode for iOS works on every iPhone, iPad, or iPod touch that is even vaguely modern, as long as you have a somewhat recent release of system software. what wallpaper is this? where can i find it? The wallpapers shown are from the iPad Air product shots, they never shipped with iOS though it seems. I didnt even switch on the grayscale mode but now, my whole ipad is black and white! i went to settings and the grayscale mode wasnt even switched on! I want it to be just like it used to be. Help please! I followed the instruction still my screen is on black and white ! My screen is still in black and white! A few days ago I picked up my ipad to use it and everything was black and white. I went to settings and thought I had checked out all of them to no avail i was ready to bring it in for repairs but decided to go onlline. I found this article. It work perfectly. Thank you so much!! Go into general- accessibilty – zoom- zoom filter – and select none. Thank you Amanda , I’m happy i kept reading so that i could get to your post . Amanda, I tried to follow your advice, but still my screen is B&W. Any Advice? It’s easy to accidentally turn on the zoom filter so disabling it is a simple solution. Paul thanks so much. My twins did something and this fixed it. Hi, I just wanted to ask is it possible to somehow apply grayscale only for an iPhone menu? As it looks so much better than mismatching coloured icons however, it’s annoying for example for games.. Thanks!